…Purple, plum, lavender, violet, pomegranate, mulberry…and the list goes on. Just some of these terms alone are enough to inspire me with their connotations of richness and delicious flavourings! My mind easily wanders back to late Summer and the deep luscious purple juices oozing from freshly picked blackberries, a surprisingly intense colour considering the almost black exterior - just one of my favourite colours. 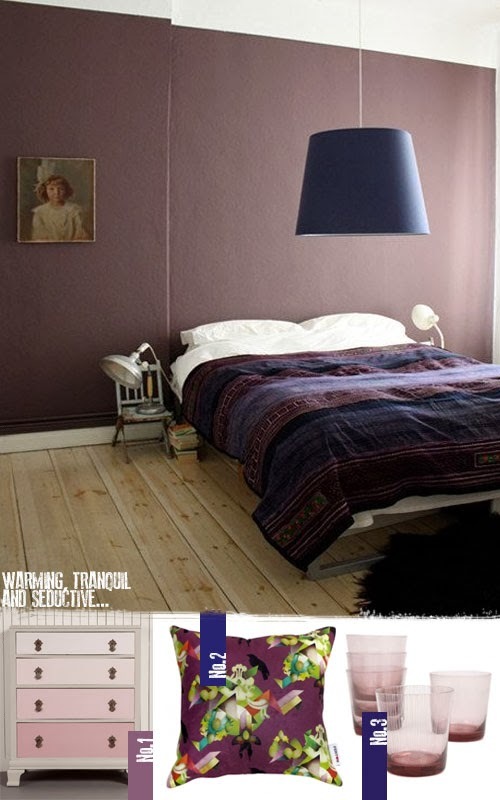 I am a huge fan of smokey shades of purple - those with a grey tint which can give a slightly urban feel. Equally, brighter and bolder versions can be so exhilarating, especially when contrasted against whites and creams. 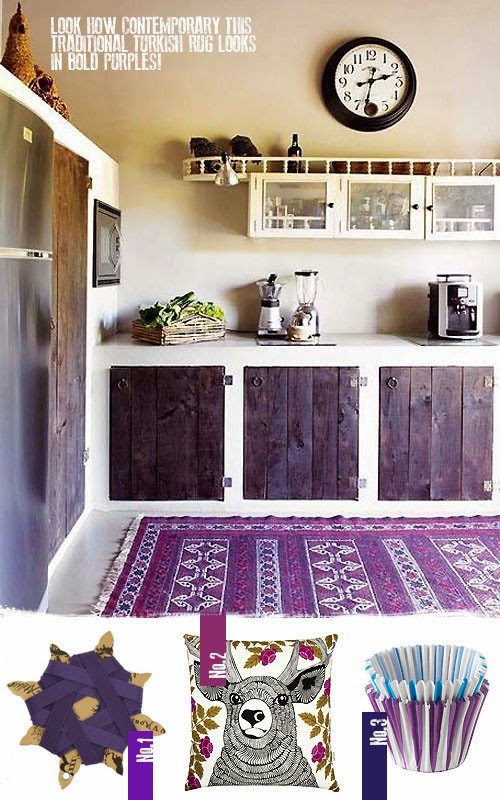 Take for example the rustic kitchen above, the wood stained doors look so incredibly rich with the blackberry wood stain and these are highlighted brilliantly against the off-white units. Also look at the vibrancy of the Turkish rug as the bright and playful colours almost appear to dance together - I love contemporary takes on classic designs! Of course, 'P' can also be for pink in this palette as it serves as the perfect partner for purples - a great medium ground colour for extending the tonal depth of a purple scheme. 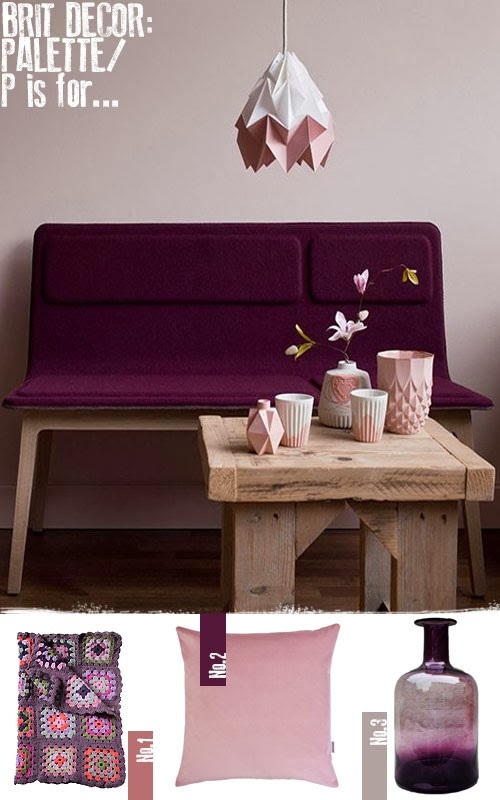 Look how in the top image the dusty pinks work so beautifully with the rich plum colouring of the sofa and check out the geo-vases - I want them all! I am also seriously tempted to snap up some reels of the divinely coloured ribbon from Pentreath & Hall - perfect for adding a luxurious feel to Christmas wrapping this year and how about the cheerful cupcake cases from IKEA!? Also from Pentreath & Hall is one of my favourite picks from this palette, the seductively smokey pink 'Parma' etched glasses and look at these alongside the striking design of the 'Evolution' cushion from the amazing Mint List.